Note: This article is about the teaching institution. For other meanings, see School (disambiguation). 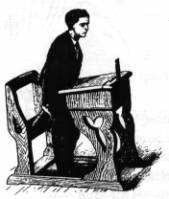 A 19th century school desk. A school is an institution for teaching. Usually in schools children are taught by adults who do teaching as their profession; these are called teachers. For practical reasons the schoolchildren are grouped in units which are called classes. Usually the children in one class are about the same age and have a comparable educational background, so they can be taught the same lessons together. Old School Punishments. Los Angeles Herald, November 1895. Traditionally, teachers are expected by society to fulfil an in loco parentis role; i.e. they should educate the children not only in knowledge but also in good behavior. Teachers were permitted and expected to punish children under their supervision who showed undesirable or unacceptable behavior such as laziness, inattentiveness, rudeness or disobedience. To maintain classroom discipline, and to get the pupils to do their best in learning their lessons, teachers (schoolmasters) have always used punishments. A wide variety of punishments has been recorded in school history across various countries and eras. Corporal punishment (see below) has played a major role in history, and in some regions until today. It is quick and usually shows immediate results in improving a schoolboy or schoolgirl's attitude. Today, school corporal punishment has been banned in some countries, and in other countries it can be legal or banned on a state-by-state and/or school-by-school basis. Non-corporal punishments often found in schools include time-outs, humiliation before the class (e.g. wearing of a dunce cap), writing lines, extra homework, chores, detention, and expulsion from school. 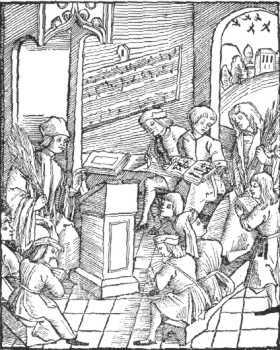 16th century engraving of music lessons. Note that there are two teachers in the scene, both of whom hold a birch in their hands as a symbol of their profession. From the first schools in Antiquity up to (and in some countries including) the 20th century, the usual method of punishment at school was some kind of corporal punishment. In Medieval and Renaissance Europe, schoolchildren were usually birched (on their bare bottoms) for correction. The birch was so vital to schooling and education in general that it became the symbol of the teacher's profession in medieval art. In the 18th and 19th century, canes were imported from the colonies to Europe and gradually replaced the birch both in schools and homes. See for example the schoolroom paintings of Albert Anker (1831-1910). South Asian teachers prefer the cane to the present today. In U.S. schools, on the contrary, the most popular spanking implement has never been the cane but was and still is the paddle.